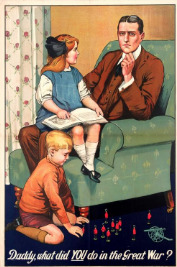 This poster implies that Daddy hasn’t done anything in the Great War. Used as a guilt tripper for soldiers to enlist. UK, 1915. Artwork by Savile Lumley.